As is befitting for a major auto show coming on the heels of a year many have dubbed 'the year of the hybrid', the Detroit Auto Show saw automakers scrambling to show off their latest innovations in hybrid technology. Noticably absent where the slough of fuel cell concepts that were the stars of previous Detroit Auto Shows and the hybrid car - present in many shapes and sizes - took their place in the spotlight at this years show. "It’s two markets. The whole country is schizophrenic. At one end of the spectrum, you have people who want ecology. At the other end, they want power. I would call this diversity." The major automakers seem to see the necessity of pleasing both ends of the market and are unveiling vehicles to fit both philosophies. "General Motors is on a continuing quest to reinvent the automobile and to remove our vehicles from the environmental debate. Central to this is GM’s three-prong advanced propulsion technology strategy... which is focused on reducing tailpipe emissions, ultimately to zero…while significantly improving fuel economy. As part of this strategy in the near term we’re improving the efficiency of both our gas and diesel engines...introducing advanced six-speed transmissions...and aggressively pursuing alternative fuels. These strides have already helped make GM an industry leader in fuel economy." General Motors used the Detroit show to formally introduced the Saturn Vue Green Line hybrid sport-utility which will go on sale this fall. The Vue hybrid utilizes GM's Belt Alternator Starter (BAS) system and features an electric motor/generator mated to a 2.4-liter VVT four-cylinder engine and four-speed transmission powertrain that delivers an estimated 27 mpg city and 32 mpg highway (29 mpg combined)—a 20% improvement in combined fuel economy compared to the conventional VUE with a smaller and less powerful 2.2-liter engine. The Vue Green Line’s mild-hybrid system provides engine shut-off at idle, fuel cut-off during deceleration, electric motor/generator assist during acceleration and the capability to capture electrical energy through regenerative braking. GM plans to offer the same system in the Chevrolet Malibu next year. GM also unvieled the new Chevy Tahoe hybrid. This two-mode hybrid is scheduled for introduction next year as a 2008 model. It's a full hybrid, incorporating two electric motors in the housing of a conventional transmission. A 25 per cent reduction in fuel consumption is claimed when the system is combined with a V8 engine using GM's Active Fuel Management system. A GMC Yukon with two-mode hybrid technology also is coming. DaimlerChrysler, with whom GM is co-developing the system, plans to subsequently offer the system in their full-sized Dodge Durango. Dieter Zetsche confirmed that Mercedes-Benz is working on a diesel-hybrid variation on the theme, and BMW, which has joined the co-development team, is expected to offer a version, according to the Toronto Star. GM also showed off its new Camaro concept that delivers 400 hp with a 6.0L V8 while getting an estimated 30+ mpg. Other GM offerings included a new Buick Enclave SUV concept as well as two new full-size Cadillac production models - the2007 EXT sports utility truck and the 2007 ESV SUV. "The innovation you see here today is just a sample of what’s going on throughout Ford Motor Company. We’re pushing Ford Motor Company to be the most innovation automotive company on the planet in design, in technological solutions to environmental challenges, and in safety." "Well, small is big these days...I think that same mode of thought is going to be relevant to the auto industry as well." Ford's lineup for the Detroit show included one of the most exciting and one of the biggest duds, in my opinion. On the top of my favorites list for the show is Ford's new diesel-electric hybrid muscle car concept, the Reflex hybrid. The innovative concept features a diesel-electric hybrid system using diesel, electric and solar power. This combination of power can deliver maximum fuel economy – up to 65 mpg in the city, says Ford – without compromising performance. Reflex stores electric power from regenerative braking and two small roof-mounted solar panels in a new generation lithium-ion battery pack. The front wheels are powered by the diesel-electric hybrid system with the 1.4 liter turbodiesel engine assisted by an electric motor. The rear axle is also powered by an additional electric motor providing this low-slung muscle car with all-wheel-drive capability. Stylish curves, gull-wing style doors and an interior which incorporates mesh seat covers for maximum airflow and comfort, LED instrument displays, advanced safety features and insulation material made out of ground rubber from scrap athletic shoes, called Nike Grind, rounds out the Reflex's features. As exciting as the Reflex is, Ford's other 'green' effort, the F250 Super Chief tri-fuel truck went off as a major dud in my book. 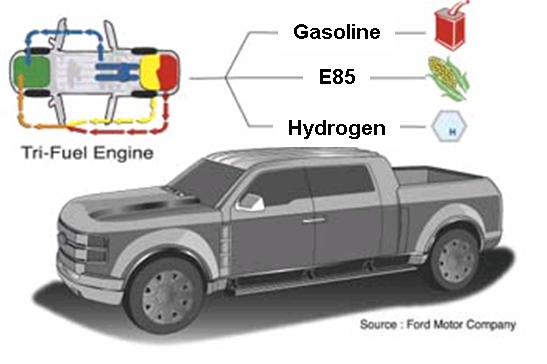 The F-250 Super Chief uses the same Ford 6.8-liter V-10 Triton engine deployed in the company’s E450 H2ICE trucks modified in this case to run on either gasoline, E85 ethanol blend or hydrogen making it a true 'tri-fuel vehicle'. MAZDA, which Ford owns a controlling interest in (about 34% I've been informed), came to the show with two interesting vehicles. The first is a hydrogen ICE-electric hybrid concept version of its Mazda5 dubbed the Mazda5 RE Hybrid (the Mazda5 is known outside the U.S. as the Premacy). The concept combines Mazda's dual-fuel, hydrogen/gasoline rotary engine (RE) with an electric motor. Mazda also showed its 2007 Tribute Hybrid, which shares its architecture and hybrid system with Ford's Escape. Rounding out Ford's production line-up was the 2007 Edge/ and Lincoln MKX cross-over suvs, the 2007 Sport Trac sport utility truck and a new Shelby GT500 Mustang. Other concept cars featured at the show included the Lincoln MKS luxury sedan and a couple coupes - the Mazda Kaburo and the Volvo C30. "The all-new 2007 Chrysler Aspen offers customers guilt-free indulgence. Loaded with premium features, stunning Chrysler design, fuel-saving MDS technology, standard safety features and best-in-class horsepower, torque and interior room, Chrysler Aspen offers more for less." 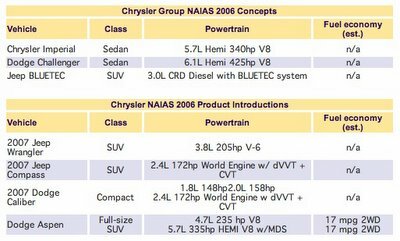 I'm not sure what exactly Jeff Bell means by 'guilt-free indulgence' in reference to the Aspen full-size SUV which gets only 17 mpg, but I do know that Chrysler was the only major automaker to show up at the Detroit show without a hybrid. 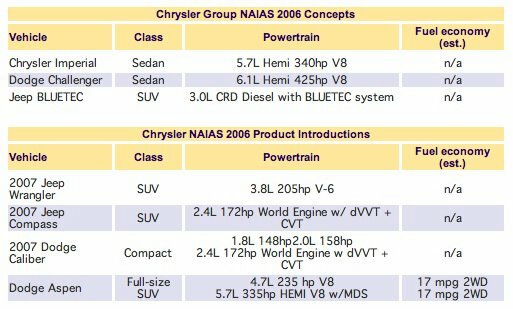 Chrysler seems to be banking on their clean high-efficiency diesel BLUETEC engines to carry their 'green' market segment demand. Chrysler plans for the BLUETEC to meet the most stringent emissions standards in the world and offer mileages competitive with hybrid vehicles. Chrysler also showcased a new six-seater addition to their growing line of neighborhood electric vehicles (NEVs) offered through their wholly-owned Global Electric Motorcars (GEM) subsidiary. 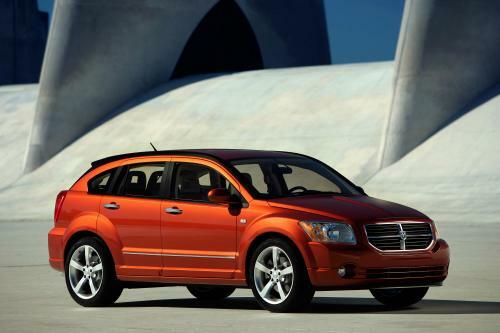 Their production models showed a similar split with the compact 2007 Dodge Caliber - which features a 1.8L or 2.4L version of Chrysler's WorldEngine with dynamic variable valve timing (dVVT) and a continuously variable transmission (CVT) - alongside several new Dodge and Jeep SUVs. "As you know, there are many reasons why consumers are interested in a hybrid, not least of which includes the constantly fluctuating cost of fuel. But it is clear today, that hybrid technology has moved solidly into the mainstream especially among consumers who are environmentally aware, and want to make a difference for future generations. But there is even more to it than that. What we have found is that owning a hybrid makes owners feel good about themselves. It’s the sheer delight of owning the latest high-tech advancement. It’s the gratification felt with fewer stops at the gas pump…and the lower cost for a fill-up. For Prius owners who are now into their second or third hybrid, it is the astounding re-sale value of their vehicles have maintained, and their industry-leading level of both customer satisfaction…and reliability. In a phrase, hybrids are quickly establishing themselves as a critical factor in Pride of Ownership." In a possible attempt to engineer a comeback for the minivan, Toyota brought their F3R minivan hybrid to the Detroit show. The F3R also features Toyota's Hybrid Synergy Drive under the hood. Toyota official unvieled the 2007 Camry as well, including the much-anticipated Camry hybrid. Featuring the newest version of the Hybrid Synergy drive, the Camry hybrid pairs a 105-kw electric motor with 199 lb-ft of torque with a lower-power (147 hp/110 kW), lower-torque (187 Nm) 2.4-liter Atkinson-cycle engine coupled to a continuously variable transmission. The result is a combined 192 hp (143 kW) from the hybrid system with 275 Nm of torque and an estimated fuel economy of 43 mpg US city, 37 mpg US highway (40 mpg US combined). The hybrid Camry features a new ultra-small inverter and a specially designed compact 244.8-volt NiMH battery pack and transaxle. Toyota expects to have the non-hybrid Camrys in showrooms in March, with the Camry Hybrid to follow several months later. Not immune to the schizophrenic market, Toyota also showed up with their huge new 2007 FJ Cruiser which they hope will compete with the H3 as well as the 380 hp V8 Lexus 460 luxury sedan. "Honda has always led the way in reducing emissions, advancing fuel economy and developing alternative fuel technologies... we have considered it as our responsibility to produce the most environmentally responsible products and technologies possible ... even as we satisfy our customers. Now ... to further advance environmental conservation, I think the entire auto industry must think of “we”—not just “me.” Each company must take responsibility and action by continuing to improve every product. Toward this end, I want to challenge the entire industry, including Honda, to further improve fuel efficiency. So, let’s enter a race together. A race for the benefit of all customers and the global environment." Honda didn't make a particularly impressive showing this year but also exhibited the market split in the two vehicles they did bring to the show. Honda showcased their Acura RDX concept SUV which features an innovative 2.3-liter four-cylinder turbocharged engine, Acura's exclusive Super Handling All-Wheel Drive, and is designed to combine sport utility with sports sedan handling and performance as Honda's entry into the premium SUV segment. This near-production prototype provides an advance preview of the all-new RDX that will go on sale this summer. 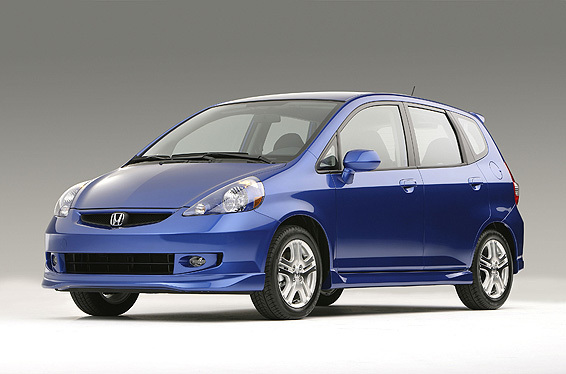 On the other side of the market split, Honda also showed off its subcompact 2007 Honda Fit due to hit U.S markets this year. The US version of the Fit, already one of Honda’s hottest selling models in Asia and Europe (where it is sold as the Jazz), is fitted with a 4-cylinder 109 hp 1.5-liter VTEC engine coupled with a 5-speed transmission (available as an automatic or manual). 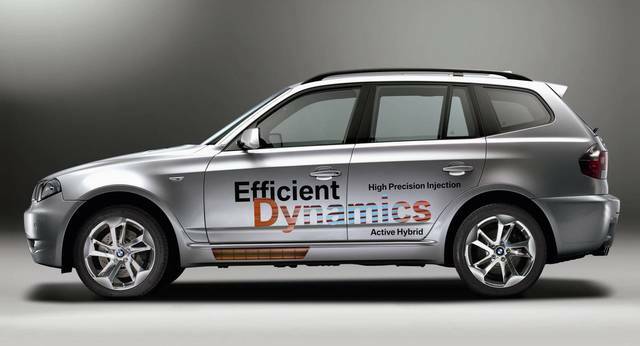 Electronic Drive-by-Wire throttle control provides quick throttle response, smooth automatic transmission shifts (on automatic transmission models) and precise fuel delivery to the engine. The 5-door hatchback delivers estimated fuel economy of 33 mpg US city, 38 mpg US highway (33.8 mpg US combined). Emissions levels are rated as Low Emissions Vehicle 2 (LEV-2) by the California Air Resources Board (CARB) and Tier 2 / Bin 5 by the EPA. Like the U.S. version of the new 2007 Toyota Yaris, the U.S. Fit sadly will not be available with the smaller engines offered in European and Asian models. Several other smaller automakers brought interesting new cars to the Detroit auto show as well. BMW debuted a concept hybrid X3 cross-over SUV that is unique in its use of supercapacitors rather than batteries for energy storage. The X3 concept is another performance hybrid SUV that combines a next-generation direct-injection inline six cylinder engine with an electric motor and supercapacitor energy storage that allows the SUV to accelerate from 0–60 mph in about 6.7 seconds. Fuel consumption compared to a conventional X3 is reduced by approximately 20% to an estimated 25 mpg US from the current 20 mpg US. Supercapacitors offer much higher power ratios than the nickel-metal hydride or lithium-ion batteries typically used in hybrids and do not store power chemically allowing them to absorb and discharge energy much faster than batteries. A supercapacitor offers specific power density of approximately 15 kW/kilogram, compared to about 1.3 kW/kg in the case of a nickel-metal hydride battery. The disadvantage of supercaps versus the battery is the far lower energy density—but given the burst-mode design of the BMW hybrid, supercaps fit the bill quite nicely. SUBARU brought to exciting vehicles to the table this year. The first is the new B5-TPH hybrid concept which applies the company’s Turbo Parallel Hybrid (TPH) powertrain system and lithium-ion battery technology in a two-seat grand touring car that offers fuel economy of 40 mpg. The Subaru TPH powertrain in the B5-TPH concept sandwiches a thin, 10-kW motor generator between a newly-developed 2.0-liter Miller cycle engine and the automatic transmission. The Miller Cycle turbo Boxer engine in the B5-TPH operates up to 30% more efficiently than a conventional gasoline engine and delivers 256 hp, with 343 Nm of torque while achieveing an estimated 40 mpg (combined). Compare this to the Toyota Camry which offers only 192 hp and achieves the same gas mileage and you'll see how exciting this concept is - granted, the 2-seater touring car is likely smaller and lighter than the Camry sedan but the B5-TPH nevertheless delivers excellent performance while simultaneously achieveing excellent gas mileage. Subaru’s parent company, Fuji Heavy Industries, has been developing the TPH powertrain for future mass production and plans to test-launch TPH-powered Subaru Legacys in the Japanese market next year [let's hope they come to the U.S. soon as well]. The second 'green machine' Subaru showcased at the Detroit show was a test version of its R1e urban electric vehicle equipped with next-generation long-life lithium-ion type batteries from NEC Lamilion Energy. Designed to meet the needs of city mobility, the subcompact Subaru R1e is projected to achieve an 80% recharge in about fifteen minutes. The resulting charge is expected to provide enough power to serve most daily commuting needs in congested urban areas. The current prototype [as of August] can be driven 75 miles (120 km) on a full charge, but the range is expected to be expanded to 124 miles (200 km). NISSAN used the Detroit show to unveil two new additions to its growing line of cars featuring continuously variable transmissions or CVT - the compact 2007 Sentra and the 2007 Versa sedan. [Nissan already offers their 2006 Murano cross-over SUV with their Xtronic CVT transmission]. The Sentra sedan features a 2.0L, 135hp four cylinder engine which when coupled with the CVT option now added to the choice of available transmission will deliver 32 mpg (combined) [a number of pics of the 2007 Sentra can be found here]. 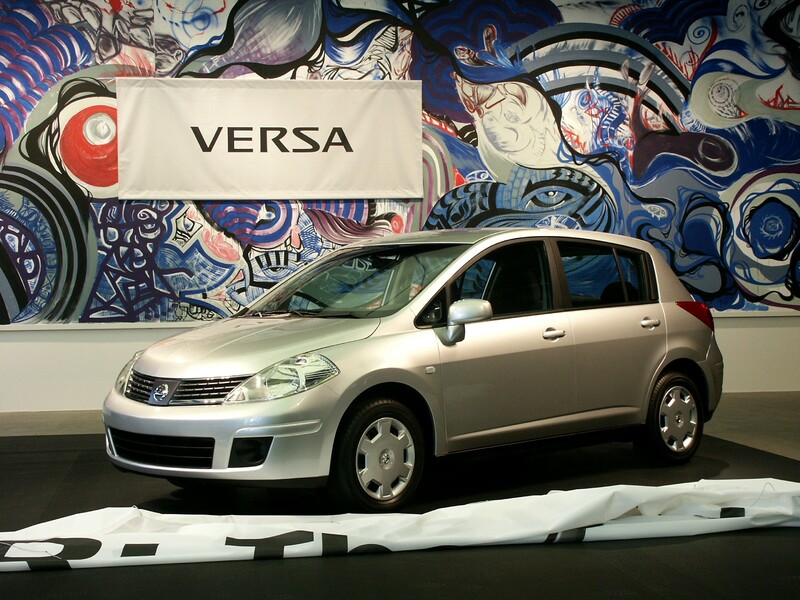 The Versa is new to the Nissan product line and is positioned below the Sentra as its new entry level vehicle and will price it starting at around $12,000 and maxing out around $15,000 while Sentra is pushed up half a knotch and gets a bit more size and content while remaining under $20,000. The Versa is available as a sedan and a hatchback and features a 1.8L four cylinder engine delivering 120 hp. The Versa will be avialable in three transmissions: a standard 6-speed manual, an available 4-speed electronically controlled automatic with overdrive and a version of Nissan’s Xtronic CVT which will offer the best fuel economy at an estimated 38 mpg combined city/highway. "Nissan remains the industry leader in CVTs, in experience, in units in operation, and in applications, with three separate CVT designs in production. CVTs give customers smooth, responsive performance and a cost-effective way to improve fuel economy. For every one million CVTs in operation, we will deliver environmental benefits equal to 200,000 hybrids." Last but certainly not least, MITSUBISHI MOTORS brought perhaps the most exciting vehicle to the Detroit Auto Show, the Mitsubishi Concept CT series-parallel hybrid. The Concept-CT MIEV is a stylish five-door, four-passenger series-parallel hybrid that uses a compact gasoline generator and a bank of high energy-density lithium-ion batteries to power the in-wheel motors and drive each of its four wheels. The 1.0-litre, three-cylinder gasoline engine is located behind the rear-seat passengers and ahead of the rear-axle line, with 20 kW (26.8 hp) electric motors in each of the four wheels yielding a combined output of 134 hp [the four in-wheel motors provide a total of 80 kW or 107 hp indicating that the gasoline engine does indeed provide some additional tractive power - about 27 hp - as well as generate electricity to charge the batteries, making the Concept-CT a true series-parallel hybrid -although more on the series side of things than, say, Toyota's Synergy Drive]. The Mitsubishi In-wheel Electric Vehicle (MIEV) hybrid powertrain is currently being tested in Japan in a 4WD Lancer Evolution prototype and was previously tested in a prototype based on the front-wheel drive Colt. 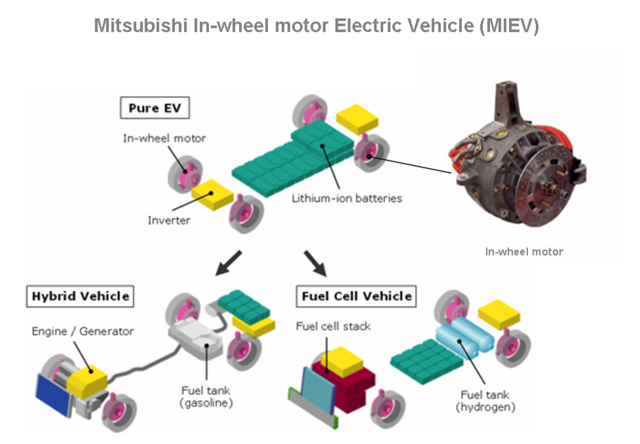 Mitsu's goal is to bring an MIEV model, built around the core technologies of in-wheel motors and high-density lithium-ion batteries, to market by 2010 (perhaps as early as 2008). More exciting still are rumors (supported by a comment from Mitsu VP for Marketing, Wayne Killan, quoted in the Chicago Tribune) that Mistubishi is working on a plug-in hybrid MIEV. The Tribune quoted Killan as saying, "We would expect the car to be used in electric-only mode only in cities, where you could have access to a quick charge," seemingly referring to plug-in capabilities. He also mentioned that the vehicle could be recharged in a scant 10 minutes suggesting the use of a quick-charge battery like those being developed by Toshiba, A123, NEC and others and featured in Subaru's R1e electric vehicle (see above). Well that rounds out the list. 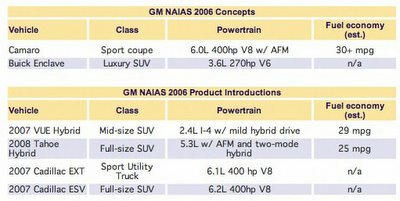 All in all, the 2006 Detroit Auto Show had quite a few exciting new vehicles to offer (amongst a few duds and a bit more of the same old new full-size SUV crud). One thing seems to be certain: the auto industry is evolving at a pretty quick pace right now. 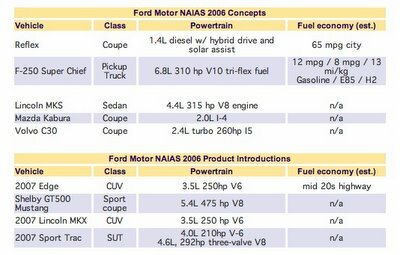 It also seems clear that the immediate focus for 'green' vehicle development has shifted from fuel cells to hybrids. I hope that this does not uneccessarily delay continued research on hydrogen vehicles and other alternatives for the long run but I'm glad to see more work being done on hybrids - hopefully with the eventual goal of plug-in hybrids on the market in a couple years. It's also good to see a bit of work on electrics as well - notably not from the major manufacturers but from the smaller Mitsubishi and Subaru. The trend with both hybrids and electrics seems to be moving towards incorporating lithium-ion batteries into production models soon which is good move in my opinion. Greater battery life and energy and power density than nickel-metal hydride batteries makes lithium-ion batteries much better suited to vehicle applications. You know, these shows are more like publicity stunts than an accurate barometer of what the company is up to; I suspect that the emphasis on hybrids is based on a market segment which is more interested in now, and less patient with technologies they can't use right away. Thanks for the detailed summary, Jess. 1. I believe the Concept-CT is a "Series Hybrid". A series hybrid's gas engine does not mechanically drive the car -- it only produces electricity, which then either goes directly to electric motors to drive the car, or is stored temporarily in batteries. Parallel hybrids (like the Honda Insight) have the engine and the motor both supplying mechanical energy to drive the car. Series-parallel hybrids (like the Toyota Prius) do both as deemed necessary by the control system. As an aside, though I'm personally a huge Honda fan, honestly the Toyota series-parallel dual motor hybrid system beats the snot out of Honda's simple motor-for-a-flywheel in terms of sophistication and cool factor. Chris, thanks for the comments/corrections. You are right on the Scion Xa/Xb mix-up. I had intended to compare the boxy F3R minivan concept with the boxy Scion Xb, not the Xa. I've made the correction. "This stylish subcompact five-door hybrid combines a 1.0-litre, three-cylinder gasoline engine, located behind the rear-seat passengers and ahead of the rear-axle line, with 20 kW electric motors in each of the four wheels. The combined output totals 134 hp." Add up the four in-wheel motors and you get 80 kW or about 107 hp which is still short of the combined 134 hp the Star lists. That also seems to imply that the gas engine has the ability to provide tractive power as well, probably to the rear axle that it is mounted next to. That would definitely make it a series-parallel hybrid. Anyway, lot's of confusion on this one but I'm going to go with the Star and the Mitsu press release and call it a series-parallel until I find out more. Hybrid and alternative fuel technology is great, definitely worthy of research investment, but our society is devoting disproportionate investment and attention to this research. The real sustainable transportation comes from changing the way we plan our cities to be walkable, bikable, and to facilitate public transportation use (for which hybrid and alternative fuel technologies will play a crucial role). Check out this OpEd piece I published called Don't Buy the Hybrid Hype.